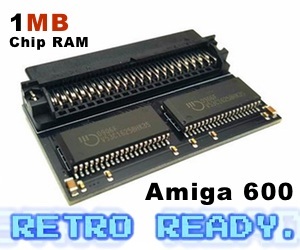 Not done with digging after old Amiga news! Some i-Glasses info from ESCOM and Amiga Technologies in 1995 on cucug got my attention. Back in 1993, I tried the Virtual Reality machine that was controlled by Amiga 3000 at Amiga Expo here in Oslo, Norway. It was really awesome. I went to this event all of its 3 days trying it and to be in Amiga heaven! However, in spring 1994 Commodore had to close. So, where would Amiga Virtual Reality go? 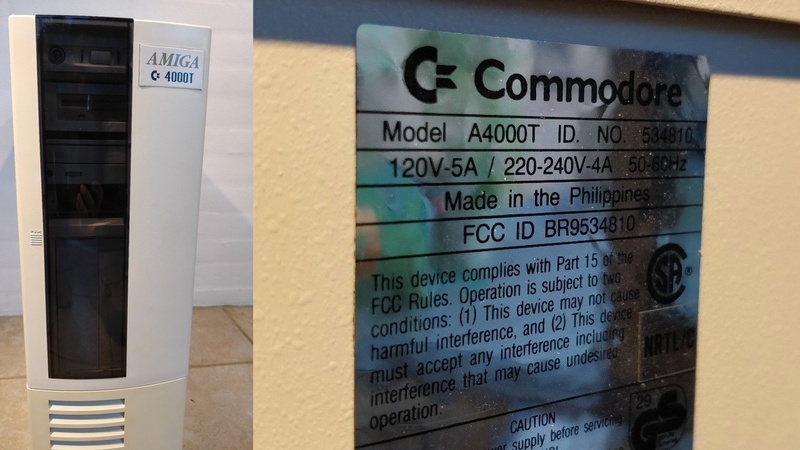 ESCOM and Amiga Technologies tried! and they tried to get it to everyones homes in 1995. What would happen if ESCOM survived. Now, that’s another thing. Heppenheim, 28.7.95. Virtual Products GmbH, subsidiary of Escom AG, the second largest computer products manufacturer and one of the largest product retailers in Europe, is the exclusive distributer of the Virtual i – O’s i – glasses in Europe. Virtual Products is concentrating on the latest 3D and VR Products, incl. Video and Software. Virtual i – glasses are a virtual reality headset and weigh only eight ounces. The Product allows users to view everything from computer games and virtual reality environments to television and video programming in full color and hi-fi stereo sound. Virtual i – glasses create the effect of a large virtual screen in front of the viewer. 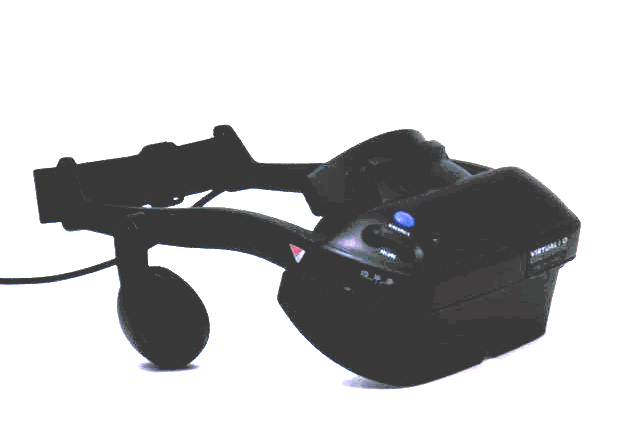 The virtual i – glasses are compatible with personal computers, Amiga, and all major gaming systems including Sega, Nintendo and Sony. It also connects to television and VCRs. The European PAL Video standard for Virtual i – glasses is exclusively developed and distributed by Escom. Please notice that the US – Version does not fit to the european PAL standard and no service can be provide. The Product is available by european dealers after the first of September 95. Virtual i – O has made some influential friends lately. IBM and Microsoft have aggreed to support the company’s i – glasses. Virtual i – O’s headset will be compatible with a large number of future Microsoft Windows 95 and IBM OS/2 games. The Amiga development community also showed interest for the i -glasses. We think that this is the break through of VR. Make your mind move. 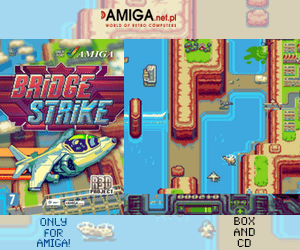 Not many Amiga games got the support. But some of the best Amiga 3D FPS games such as Nemac IV DC and Gloom Deluxe got native support. When you start Gloom Deluxe preferences. Then you can choose to use i-Glasses mode or not. It was pretty awesome, but people didn’t understand where Virtual Reality marked was heading and in summer 1996 ESCOM had to close it doors. 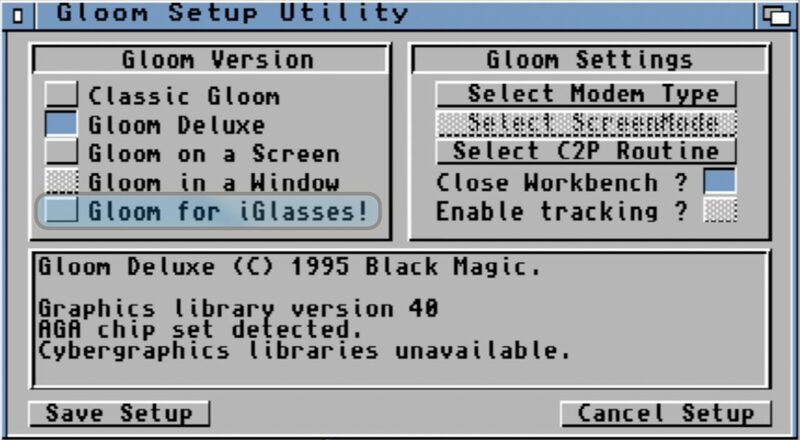 Here is how Gloom Deluxe version that came out in 1995 offered support for these i-Glasses from ESCOM and Amiga Technologies. Including iGlasses! it also supports to be played on a Screen and in a Window! You can also select different C2P Routine for the game. A fantastic 3D FPS game for Amiga! Virtual Reality seems to get the push it needs these days. But is people Ready for VR yet? Today that 3D trend have changed for the better all in all. But, will it become huge? We will see. But Amiga market as seen here tried several times to move 3D VR market without luck. These virtual i – glasses are compatible with not only Amiga. They were made for PC’s and all major gaming systems including Sega, Nintendo and Sony.